LONDON — Almost three years after Britain narrowly voted to leave the European Union, Prime Minister Theresa May appears to have played her final card as the clock ticks to a deadline that's just nine days away. 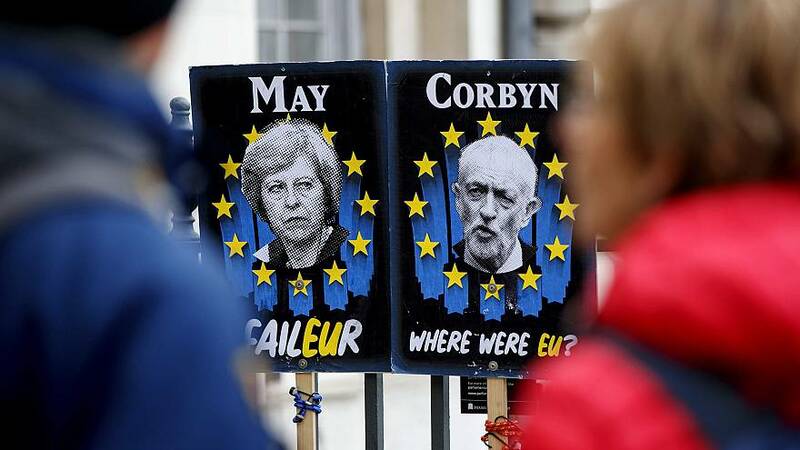 After chairing a seven-hour meeting of her Cabinet on Tuesday, the Conservative politician announced that she would seek to end the long, torturous impasse over Brexit in Parliament by offering to work with Jeremy Corbyn, the left-wing leader of the opposition Labour Party. May has so far failed at every hurdle to make Brexit happen on her terms. Her withdrawal agreement, which took two years to negotiate and was backed by all 27 other E.U. countries, has been rejected by British lawmakers three times. And there is nothing to suggest her deal would win enough support now. A bill making its way through the House of Commons on Wednesday would force the government to ask the E.U. to delay the divorce, which was originally due to happen last Friday. It was moved to April 12 due to the political deadlock. If the bill passes, it could extend the process by up to 12 months. The stakes could not be higher. So how does the U.K. get out of this mess? Here's a guide to how we got here and what might happen next. Addressing the nation after Tuesday's marathon meeting, May said: "This debate, this division, cannot drag on much longer. It is putting members of Parliament and everyone else under immense pressure and it is doing damage to our politics." Seeking to "break the log jam," she offered to meet with Corbyn to "try to agree a plan that we would both stick to, to ensure that we leave the European Union and that we do so with a deal." While some lawmakers within her Conservative Party are pushing for a clean break with the E.U., agreeing to sit down with Corbyn suggests May is willing to compromise and consider a "softer" Brexit to finally reach an end to the process. May was so keen to speak publicly about her proposal before any disgruntled ministers could leak everything to the press, multiple reports assert that she told her Cabinet to stay in her 10 Downing Street residence and offices while making her statement. As is typical for these meetings, their phones had been confiscated. May had been pushing for a relatively hard Brexit, which would mean an arm's-length relationship with the E.U. and ending the U.K.'s membership of the single market and customs union, which allow E.U. states to freely trade among each other at no cost and with virtually no border checks or red tape. It would also eliminate the freedom of all E.U. citizens to travel, live and work across the bloc. These were May's so-called red lines, things she wouldn't back down on. She has spent months saying lawmakers are faced with her deal, no deal, or no Brexit whatsoever. But now, finally, a compromise looks more likely. All this has gone down badly with Conservative Brexiteers. Two of May's ministers resigned Wednesday. Former Conservative leader Iain Duncan-Smith wrote an article for the Daily Telegraph with the headline "The PM's capitulation to Jeremy Corbyn makes me fear for my country." Opponents of Brexit, who would prefer a second referendum, believe May's gambit is just another way for the prime minister to get her deal passed. While Labour also promised voters at the last general election in 2017 that it would make Brexit happen, it has been pushing for the U.K. to remain in a customs union in order to safeguard jobs that rely on E.U. trade and to mitigate the economic impactof leaving the world's largest trading bloc. How much common ground is there between May and Corbyn? Oddly, their views on Brexit are in many ways quite similar. It's just their parties that don't agree with them. Speaking in the House of Commons on Wednesday, May said: "I think there are a number of areas where we agree on Brexit, we both want to deliver leaving the E.U. with a deal, we both want to protect jobs, we both want to end free movement, we both recognize the importance of the withdrawal agreement." But Labour's demands were unclear as of Wednesday afternoon. Could May and Corbyn go back to the E.U. with a new proposal? Not quite. The E.U. has been very clear that the withdrawal agreement it negotiated with the U.K. in November is the only deal on the table. The only thing that could change is the political declaration that goes along with this, which governs the future U.K.-E.U. relationship and isn't strictly legally binding. This is all made complicated by the nature of the E.U., which can only make big decisions unanimously as a bloc of 27 nations. Each nation has a veto and can block anything it doesn't like. What are the chances of a second referendum? The 2016 referendum simply asked voters whether they wanted to leave or remain in the E.U. Some believe it's now necessary to put all the various options — including May's withdrawal agreement, a "no-deal" Brexit and perhaps even remaining in the E.U. — to the people. Both the Conservatives and Labour promised before the 2017 general election to leave the E.U. and respect the results of the Brexit referendum. However, a "People's Vote" is an increasingly popular policy among Labour lawmakers and grassroots members. At its policy-making annual conference last year, Labour agreed to explore the possibility of a second referendum if Parliament couldn't pass an acceptable Brexit deal on its own. But Corbyn has shown little appetite for another referendum, which was cited as one of the main reasons behind a group of lawmakers quitting the party to form their own earlier this year. Despite internal pressure, it's unclear whether Labour would demand that May agrees to a second referendum. However, Labour lawmaker and Corbyn ally Rebecca Long-Bailey told Sky News Wednesday that "if we get exactly what we want, I would struggle to find a reason to put that to a public vote." Even if a referendum is agreed, a monumental battle would then begin over what options to put on the ballot paper. If remaining in the E.U. is an option, Brexiteers would declare the process undemocratic. And all this leaves open the possibility that Corbyn could agree a withdrawal deal with May and end up campaigning to leave the E.U. on those terms and against the majority of Labour lawmakers and the party's grassroots members. Professor Tim Bale, from Queen Mary University in London, told NBC News that lack of party loyalty in Parliament that had emerged due to Brexit was unprecedented. "Party discipline appears to have completely broken down," he said. "If some sort of deal was to be agreed and as part of that we were to see a second referendum then Labour's stance would be quite questionable. Having agreed it would they then have to support it? Or would it mean they are able to say it was the best they could come up with and they still don't agree with it." Bale added: "There would have to be almost a free-for-all in that referendum so anyone in any party would be allowed to campaign for either side." It would be hard for Corbyn to back a Leave campaign having backed Remain in 2016, according to Bale, despite accusations that the Labour leader's support was lackluster. What if May and Corbyn can't agree anything? Crucially, May also said in her statement on Tuesday that if the two party leaders can't agree a way forward she would accept any deal that the Parliament approves next week, a sign of how weak she is. But after voting on a number of options, lawmakers in the House of Commons have also been unable to find a solution. Will this go on forever? The E.U. has said it would grant another extension to the Brexit process beyond April 12 if there's a good reason for it — such as the Parliament finally agreeing to a deal. However, both May and the E.U have said the process must not extend beyond May 22, the day before European Parliament elections. May is desperate to avoid the bizarre spectacle of the U.K. holding such elections three years after voting to leave the E.U. If the U.K. does nothing and doesn't get another extension from Brussels to finalize a deal, it will exit the E.U. with no deal on April 12. Economic misery, chaos at ports, grounded flights and food shortages are all possibilities, according to analysts. Overnight, the country would lose more than 40 years of trade agreements, laws and regulations as well as automatic trading access to E.U. nations, which account for more than half of national trade. The U.K. would default to World Trade Organisation rules, which would mean imposing big charges or tariffs on imports. On day one under this scenario, the U.K. would charge 10 percent to car importers and as much as 35 percent for dairy products, for example. British people would also immediately lose the right to move freely across the bloc. The government has spent more than £4.2 billion ($5.5 billion) in preparing the country for this scenario, with the state-run National Health Service investing in a large number of fridges to stockpile medicines and even extra body bags. Some believe this to be the best course of action for the country as it would allow the government to sign bilateral trade deals with any country in the world. E.U. members cannot do this. Bale, the professor, pointed out that Brexit could potentially only be delayed by a matter of weeks. "If she can't cobble something together with Jeremy Corbyn that would get through the House of Commons, we'd still be left with the situation where no deal is possible on or around May 22," he said.